As Wilde envisioned it, the new magazine was to be “the organ of women of intellect, culture and position,” with articles on literature, culture, the arts, society, and even politics, concentrating on women’s position in these areas (ibid., note 3). Both The Woman’s World and its predecessor, The Lady’s World, must first and foremost be seen as commercial enterprises whose publication and circulation took place within a specific historical, economic, cultural, and sociopolitical context. The Lady’s World and The Woman’s World were part of a developing market of women’s periodicals that were just starting to constitute their own special niche, while still being part of a strongly gendered world of Victorian periodicals. While the predominantly male press addressed current and controversial topics of politics, religion, finance, and economics, the female press consisted mainly of topics in the arts, belles lettres, fiction, fashion, music, and gossip. The large market of family periodicals, aimed at both male and female adult readers as well as (to a certain extent) children, was also marked by an exclusion of “material regarded as potentially controversial and inappropriate for women” (Brake, 128). In conjunction with a general explosive growth of the publishing industry, “the last two decades of Victoria’s reign were years of unparalleled expansion in publishing for women … not less than forty-eight new titles entered the field between 1880 and 1900″ (White, 58). The new and complex evolving market of women’s periodicals was by no means uniform; following the laws of the market, there seems to have been a magazine for just about every woman, in every situation in life: working girls and lower-middle class working mothers supporting their families, middle-and upper-class housewives concerned with the social and economic management of their households and mainly interested in home topics (the hugely popular genre of “housewife” periodicals came to dominate the market), upper-class society ladies, in all their different ranks of the aristocratic and mercantile hierarchy. The picture is a complex one, and so the image of “‘womanliness’ the magazines sought to produce was always contradictory and entangled with other differences–especially those of class, nation and religion” (Beetham, ix). Within a Victorian market especially geared toward female consumers and their generically presumed topics of interest, cultural and socioeconomic constructions of what it meant to be female–what one had to do, to wear, to think, to say, and, above all, to buy–must be seen as important interventions into the debate around gender issues and male and female roles in society. Despite the overall complexity of this marketplace, it one can easily make some general observations about certain recurring themes and features. In what Beetham calls the “Ladies’ Papers” of the 1860s to early 1890s, for example, the concentration on the topics of beauty (still led by the ideal of female beauty that persisted in high art), fashion and genteel household management and domesticity, as well as society columns, in Beetham’s opinion all “combined to create a femininity of surface rather than depth, of appearance rather than moral management” (Beetham, 90). Interestingly enough, The Lady’s World and The Woman’s World can be seen as emerging from just such an upper-middle class market that had educated, upwardly mobile women as its marketing target, whose roots or affinities, however, still lay with London society (which was still very much hierarchized by aristocratic rank and affiliation). However, The Woman’s World, although practically re-entering into the same market as its predecessor, took a very different stance towards its readers. Brake’s excellent overview and comparison of the two magazines’ content and layout cites evidence that The Lady’s Worldclearly followed a “construction of women as leisured, domesticated, interested in society gossip, seemly accomplishments, sport, clothes, and a modicum of culture” (Brake, 136). Sos Eltis recounts the regular columns of The Lady’s World as follows: “Regular monthly features were ‘Fashionable Marriages’, ‘Society Pleasures’, ‘With Needle and Thread: the Work of Today’, ‘Five O’Clock Tea’ (an account of the latest fashionable tea-parties and receptions), and ‘Pastimes for Ladies’, of which typical examples were shell- and pebble-painting, mirror-painting, or, for the more adventurous, sleighing” (Eltis, 8). Wilde himself observed in a letter to Mrs Hamilton King that The Lady’s World was “a very vulgar, trivial, and stupid production, with its silly gossip about silly people, and its social inanities” ([? Sept 1887], Hart-Davis 1962, 205). Women were mainly addressed as consumers, as the intricate fashion plates, and the elaborate advertising sheet showed. It seems that it was mainly “the presence of commerce in the arguably literary to which Wilde objected” (Brake, 137). As chief editor, however, Wilde was not immune to the commercial context. Not only had he originally taken on his job as an editor because he urgently needed the money, but he also let the publishing house use his name as advertisement on the cover. Against the open commodification of the female readership of The Lady’s World,The Woman’s World does not only try out a different format, but a different politics of content as well. In The Woman’s World, “women are constructed as serious readers who want (and need) education and accculturation[sic]” (Brake, 142). For such a magazine, the name The Lady’s World, alluding to the tradition of women’s magazines that aimed at “re-making the lady” (Beetham, 89), was no longer a fitting description. At the particular urge of Mrs. Craik (a well-known authoress at that time, and part of Wilde’s circle of acquaintances), the new editor was persuaded to change it into The Woman’s World (Ellmann, 292). The format of the new magazine were slightly enlarged numbers (48 instead of 36 pages), with a variety of both regular columns and solicited articles, the overwhelming majority of which were written by women. Wilde obviously used his wide circle of personal acqaintances to ask women of some standing in the cultural life of London to contribute to the magazine, but he also quite frequently included little-known female writers (whom he thought promising), and chose contributors according to specific topics that he wanted The Woman’s World to address. In Ellmann’s words, “Wilde had eclectic tastes and tried women of very diverse interests; the magazine took on a miscellaneous look which it never lost” (Ellmann, 292). But the dominant feature of the magazine was its concentration on the work of women in the public sphere (especially in the arts), both in the fact that its material was mainly written by women, in Wilde’s championship of women writers in his Literary Notes, and in the actual content of the articles. Some prominent subjects in the twenty-odd issues under Wilde’s editorship are, significantly, higher education for women, the political status of women and the debate about the ‘woman question’, the question of female moral leadership, the debate surrounding scientific theories of women’s physical and mental inferiority to men, and the relation of the sexes in marriage and in society in general. The magazine also made a point of describing and addressing new professions for women (like medicine, teaching, nursing). Regular columns include reviews of current theater productions or famous actresses, articles about great female figures in the arts (e.g., Christina Rossetti [Feb 1888], Russian painter Mary Bashkirtseff [June 1888], and poetess Carmen Sylva [March 1888]), and about women’s life in different historical societies and cultures (e.g. “A Pompeian Lady” [Oct 1888], “A Lady in Ancient Egypt” [Nov 1888], “Roman Women at the Beginning of the Empire” [Sept 1888]). There are regular travel reports written by women, topics of arts and crafts interest (e.g. about embroidery or lace-making), a serial fiction story, and short stories and poems by women writers like Olive Schreiner, or Violet Fane. Ireland featured prominently in The Woman’s World (in travel reports, arts and crafts, and literary notes) and here, too, Wilde “made sure that there was a place in the magazine for Irish women” (Coakley, 192), among them, of course, his mother, Lady Wilde, as well as some of her friends. For female authors’ contributions to The Woman’s World, individual “signature is mainly in the form of forenames and surnames […], a form which invokes the convention of the professonal (male) writer” (Brake, 139). The prominent announcement of names on the cover also functions as an important advertising function. According to Brake, “[t]he personalizing of journalism and the trailing of names associated with the disappearance of anonymity and the advent of the new journalism are far more pronounced in The Woman’s World; these new features credit the reader with more knowledge of authorship in general and also make more explicit the commodity identity of the periodical (it is commercial and for sale) and the consumer position of the reader whose discretion in purchasing the article is wooed through the renown of named contributors” (Brake, 135). The most obvious important overall change to the magazine under Wilde’s editorship was the cover layout. The Lady’s World’s cover was a female figure (elevated like a mythological goddess on a pedestal), disinterestedly holding a book in her left hand, while gazing into her own image in a mirror in her right hand (an image of woman which in and by itself seems telling). Under Wilde’s editorship, not only does the title of the publication change, but the cover also announces and advertises its editor, and some of the most well-known contributors of articles. 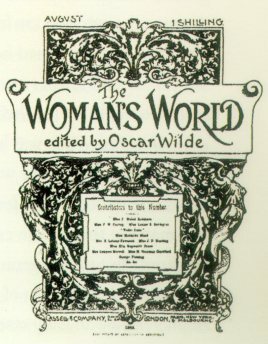 The fact that the title page of The Woman’s Worldprominently displayed the name of Oscar Wilde and uses his name to advertise itself, geared readers’ expectations towards the subject-matter of art as associated with Wilde’s name. The new layout, accordingly, evokes the context of Aestheticism as an art movement: having gotten rid of The Lady’s World’ssymbolic goddess, it is markedly abstract and vaguely aestheticized, in art nouveau fashion. Aestheticism as an avant-garde art movement also featured prominently in the magazine. The arrangement of articles within the single issues of The Woman’s World, and the omission of certain columns that had been there before, were also significant. Instead of opening each issue with the monthly fashion report, as The Lady’s World had done, it was moved to the end of the magazine. There were no music and no gossip columns. However, to a certain extent, the idea of ‘gossip’ was retained, although elevated to a higher cultural level, through a change of form from social into literary discourse in Wilde’s Literary Notes. In another letter, Wilde had announced: “I am going to make literary criticism on of the features of the Woman’s World, and to give special prominence to books written by women” (Hart-Davis 1985, 70-1). From these notes (which appeared regularly only in the first five issues [Nov 1887-March 1888], and then again from issues 14 to 21 on, in slightly modified form [Dec 1888-July 1889], it is clear that Wilde took his task of literary criticism of women’s work very seriously, and treated it on an equal plane with that of male writers. From this short overview of the magazine’s layout and selection of articles under Wilde’s control, it seems to me to have become sufficiently clear that Wilde was consciously following an agenda of promoting and championing a construction of women as intellectually, culturally, politically, and even scientifically interested readers – serious intellectual beings who would find in The Woman’s World “an organ through which they can express their views on life and things,” as Oscar Wilde wrote in a letter to a potential female contributor to the magazine (Letter to Helena Sickert [27 May 1887]; Hart-Davis 1962, 69). Beetham, Margaret. A Magazine of Her Own? Domesticity and Desire in the Woman’s Magazine 1800-1914. London: Routledge, 1996. Eltis, Sos. Revising Wilde: Society and Subversion in the Plays of Oscar Wilde. Oxford: Oxford University Press, 1996. Fish, Arthur. “Oscar Wilde as Editor.” Harper’s Weekly (New York), Oct 4, 1913, pp. 18-20. Gagnier, Regenia. Idylls of the Marketplace: Oscar Wilde and the Victorian Public. Stanford: Stanford University Press, 1986. Hart-Davis, Rupert (ed. ), The Letters of Oscar Wilde. London: Harcourt Brace, 1962. —— (ed.). More Letters of Oscar Wilde. 1985. Repr. London: Harcourt Brace, 1986. White, Cynthia L. Women’s Magazines 1693-1968. London: Joseph, 1970. And that’s exactly what I did, chuckling like a happy fool. I couldn’t wait to share this with my students and eventually the public. This would be fun! My Stanford course this quarter is a traditional humanities seminar on the relationship between Oscar Wilde’s work and authors such as Baudelaire, Huysmans, Rachilde, Mallarmé, Gide, Lorrain, and others, with face-to-face classroom discussion, papers, readings, office hours, and all that. But we are also experimenting with online learning elements and a partially open M(inimalist)OOC format around the theme of close reading, as our website describes and I also discussed in a recent workshop at Duke University. The Twitter role-play is another creative way to imagine close reading and collaborative practices online. You can find my assignment prompt here. I am not aware that this kind of thing has ever been done before and had no idea whether it would actually take off on Twitter—after all, inviting open public participation throws you on the public’s mercy. I was convinced it was worth a try, however. Like so many of my traditional humanities teacher colleagues not originally trained in digital humanities, I have been a late convert to Twitter, but now I use it regularly and happily for professional and intellectual purposes. It is a great source of information, certainly, but for me one of Twitter’s most wonderful aspects is its spontaneous interactivity with interested and knowledgeable strangers on topics of mutual interest. New ideas are sparked via these interactions; wise and thoughtful observations, hilarious and clever commentary happen here, engaging brains and hearts. Most often, one leaves with a sense of having learned something worth contemplating, and being thankful for the open format. I knew Twitter was right for this new kind of exercise. My students commented afterwards that it was wonderful to feel connected to other readers and students at different institutions studying the same material, and that they had gained some new comparative insights across 19th-century texts. The Twitter format is interesting here because it really forces readers to approach textual analysis differently: in tweets of 140 characters or less, one must be creative to make a good or witty statement effectively; one writes and reads, in fact, together with unknown others who may have new insights or questions. And to impersonate a well-known literary personage, one must imagine and creatively imitate that particular character’s style and point of view. The role-play also bridged the gap between our collaborative (openly accessible), but more static class blog, and the spurting intensity and spontaneity of a social media discussion, making us feel more connected to the world and enhancing our class blogging experience in turn. @petradt Thanks for prompting such a great Twitter day! My org is planning on borrowing the concept during our big book weekend this March. @WildeDecadents We'll probably have different staffers take on personalities of different characters. I want Magwitch & Miss Havisham. Future Twitter role-plays might pop up in other contexts, perhaps, e.g. in political, economic, or other cultural arenas. Remember that brilliant spontaneous hashtag impersonation during the debates, @InvisibleObama? What about impersonating characters and collaboratively writing Twitter scripts for “Personages from History Debate American Politics”; “A Day of Reckoning for Goldman-Sachs”; “[Insert popular movie characters of film x] against [the producer and director of popular movie x]”; or my personal favorite, “International Writers United against Pesky English Grammar”? I’d like to challenge you right now to start your own for Digital Writing Month! What can we learn when we don’t control the rules or outcomes of others’ writing? What can we learn from one another when we are freed from the shackles of our own online identity and give ourselves permission to play? I’ll be @petradt, and I approve your message.